For generations, Albers® Corn Meal has been a staple in households all over the country. We use only premium corn and a custom process to mill our grits finely, which produces a smooth, delicious texture when prepared. 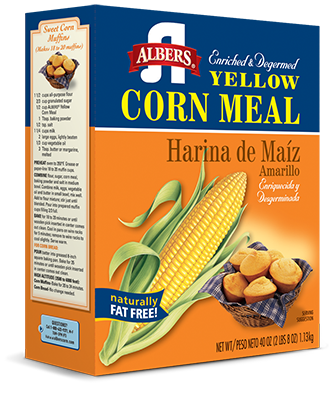 Albers Yellow Corn Meals are essential ingredients to prepare everything from sweet corn bread and corn muffins to fried fish and chicken. Check out some of our family favorite recipes here. 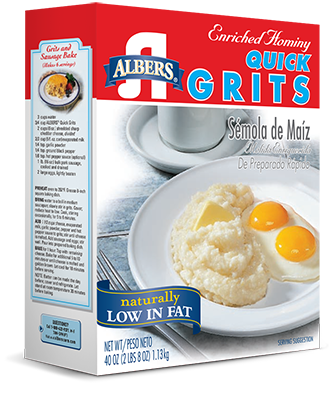 Grits are a southern staple and Albers® Quick Grits embody that rich history. We use premium corn and mill our grits in a unique process that produces a smooth, delicious texture when prepared. Our grits create tasty, satisfying side dishes and main meals at breakfast, lunch and dinner. Some of our favorite grits recipes can be found here. We use only premium corn and a custom process to mill our grits finely, which produces a smooth, delicious texture when prepared. 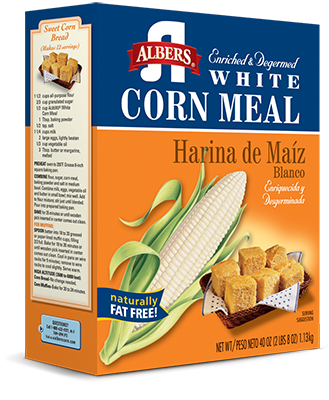 Albers White Corn Meals are essential ingredients to prepare everything from sweet corn bread and corn muffins to fried fish and chicken. Check out some of our family favorite recipes here.